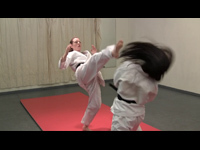 In this fantasy karate video, VeVe practices her new, devastating Iron Palm and Iron Kick techniques on Indra. The scene opens both ladies are in their karate uniforms. They bow to each other, and the session begins. VeVe begins with the "Iron Kick," throwing front kicks, side kicks, and roundhouse kicks to Indra's chest, belly, and head. Indra staggers from each kick, but faithfully returns to receive the next. Eventually the punishment becomes too much, and she falls to the floor (~4 minutes of kicks). VeVe then moves on to the "Iron Palm." She throws palm heel strikes and chops to Indra's belly and chest, eventually removing Indra's uniform jacket in order to practice the belly strikes better (~5 minutes standing strikes). The blows stagger Indra, but after several minutes they prove to be too much and she falls to the floor. But VeVe is not finished and continues to palm strike at Indra's belly and chest as Indra lays on the floor. The strikes prove devastating to Indra and she eventually passes out from the pain (~8 min floor strikes). After a fade out and fade back, Indra shows off her red belly from where VeVe had been palm striking her. Camera angle include: full body, hip-to-neck, and close-up on belly. Kicks and strikes are fast and accurate but in fantasy style with light contact. Kicks to head do not contact but are thrown strongly and with style. Palm strikes to bare belly are strong and have a good slapping sound.